The Deluxe nature of the Asus P7P55D Deluxe motherboard is obvious from the shiny plug-in TurboV remote control that comes bundled with it. Designed to offload the overclocking demands from the BIOS, it enables both on-the-fly and profile-based overclocks at the press of a few buttons. All the motherboard manufacturers are trying to make overclocking a key part of the P55 experience. You'll still have better results getting down and dirty with the BIOS settings, but it's a great start for the novice or the mainstream user. 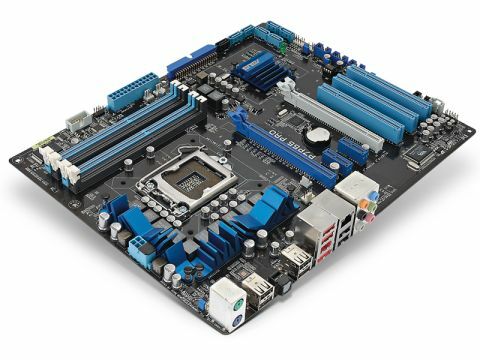 Asus' Deluxe P55 board is itself a demon overclocker, enabling us to push our 2.93GHz Core i7 870 up by just over 1GHz. And that's an astounding result. Its memory bandwidth isn't the best in high-end terms, but as we've seen, bandwidth doesn't maketh the benchmark. Still, it's an expensive first outing for the P55 and we can't wait to see how the more affordable boards in the range perform when they tip up.